What this Ride With Your Mind Coach thinks about before, during and after lessons. Learning theory, skill retention, attitudes within disciplines, horse behavior, horse training, biomechanics of the rider, biomechanics of the horse, horsemanship. And then I say, “great, I have so many good resources I can recommend… but I don’t have a list of them. I should put it on my website for you.” And then I pull out the book I always recommend first because I keep a copy in the tack room, and that’s as far as we get. So, dear students, please accept my apologies for taking so long to do this, finally. When you click on a book here and then purchase it from Amazon, I’ll earn a small referral fee, but the price you pay is no higher than it would otherwise be. Ride With Your Mind Essentials: Innovative Learning Strategies for Basic Riding Skills, by Mary Wanless - the book I always recommend for those new to rider biomechanics. My tack room copy is full of notes and tabbed so I can refer to sections quickly after a lesson to help make a concept easier to grasp. Riders everywhere will appreciate the clarity, brevity, and well laid out concepts with easy to follow descriptions, questions at the end of each chapter, and extremely accurate diagrams. The Horse Behaviour Handbook, by Abigail Hogg - the book I recommend for folks with less than 30 years experience with horses. Even I, with more than 30 years experience, learned a thing or two about horse behavior while paging through this informative and colorful manual. I particularly liked the idea that social relationships among horses are way more important to them than I ever gave them credit for. It would take decades of only private lessons to glean what you can absorb from a thorough read of this book. Language Signs and Calming Signals of Horses: Recognition and Application, by Rachael Draaisma - the book I recommend for anyone looking to better understand what horses are conveying when they move their ears, turn their head, and even blink. There are so many nuances to a horse’s communication that go straight over our heads, and Draaisma helps clarify what it all means, which is a huge help to our interactions with them. The Horse: The Epic History of Our Noble Companion, by Wendy Williams - the book I recommend for anyone interested in a fascinating journey through the evolution of the horse. New archaeological discoveries explain a lot about why horses are the way they are today. There’s a lot of talk about bones, but Williams makes it all relatable to our experience of horses as we know them now. I learned SO much about horses, and I thought I knew a lot! DressageTraining.TV - the subscription website where Mary Wanless, with the technical assistance of one of her coaches Peter Dove, puts out high quality videos demonstrating the Ride With Your Mind method in action. The fee is commensurate with the product, and serves as a valuable supplement to lessons for those who learn well from watching videos. There is a mix of live coaching demonstrations led by Mary and some of the other coaches, explanations off-horse, explanations on-horse, and actual lessons with RWYM coaches and a students with wide variety of skills. There are also videos covering horse training, rider body awareness and strength/flexibility, and more. The part I like most is watching the coaches help various riders make changes to their riding and seeing the horses change positively in response. There are many more resources I can point to that have helped me and my students toward better horse riding and stewardship, but for now these are the big ones. Mary Wanless has several other books, as well as another website and a whole trove of DVD’s that are not part of the DressageTraining.TV website - all of which I recommend highly. Not to mention she does clinics in the UK and I host her here in Maryland twice a year for 3-day rider biomechanics clinics that you are welcome to participate in, as rider or auditor! Happy New Year from Heart of Riding! I would like to wish you a happy and healthy new year. My baby, Heart of Riding LLC, is celebrating its one year anniversary this month! Those of you who were with me in 2016, thank you from the bottom of my heart, it means so much to me that you helped make Heart of Riding's first year an amazing one! For those of you who witnessed the birth of Heart of Riding, you too deserve many thanks for bearing with me during the transition. Becoming an entrepreneur required a lot of help from my friends, and I truly appreciate it. 2016 recap: So many magnificent students, horses, and teachers, wow! I traveled to Middletown, Frederick, and Poolesville to teach, and early in the year even traveled to New Jersey to visit a couple Ride With Your Mind friends and do a little co-teaching there with them. It was my first journey out as Heart of Riding ambassador, and it was perfect. Heart of Riding hosted Mary Wanless twice: both clinics were incredibly informative as usual, and a huge success due to lovely participants and loads of behind-the-scenes help from the fabulous Mary Kaminski of EponaHeart Counseling as well as all of the staff at Great Strides, my lovely home barn in Damascus, MD. Special thanks to everyone who helped out on the last day of the last clinic, when I was so sick I should have been in bed (and the next day, when I WAS in bed instead of cleaning up/ferrying Mary to the airport). My sincere apologies to anyone who caught my illness. The only consolation was that even though MW did catch it, she said it only lasted a couple days. The horses I teach on at Great Strides came through with flying colors, three of whom are owned by the ultra-caring Terry Lewis, owner of Great Strides. Terry's support and encouragement has been crucial to the development of Heart of Riding, and its success is owed greatly to the partnership Terry, her horses and I have forged over more than a decade of working together. Josh, who had been out with arthritis issues for most of 2016, appears to have recovered nicely. His owner Mary Kaminski and I have been thrilled, along with my students, that he has worked his way back into lessons. He is a remarkable horse, I am so happy he's feeling better! Despite the sad news that Terry has decided to sell the farm, no bids have been made and Great Strides has decided to carry on with our small co-op boarding operation until the farm is sold. Once the farm is sold, the horses will move to a (tbd) location nearby, and the plan is that I will continue teaching lessons with the same school horses if possible at the new location. I will of course keep my students informed on an as-needed basis. Nothing stays the same, and while it has been an immensely challenging and rewarding experience to steward this land and the horses upon it, I am looking forward to newer and better things, with Heart of Riding at the fore. At the end of the summer I had the pleasure of getting together with a bunch of friends for three whole days of nonstop riding, coaching, learning and discussions about practically everything you can imagine related to riding. The amount of experience and skills they bring to the table is absolutely awe-inspiring. We laughed, we sweated, we ate fabulous food and I came away rejuvenated and brimming with new ways to explain things I didn't even know could be explained better in the first place! 2017 plans: more Heart of Riding! I'm looking forward to doing clinics in Pennsylvania, hosting Mary Wanless in the spring and fall as always, possibly hosting another Ride With Your Mind Teacher Training, branching out to other barns as a position specialist, and of course continuing to push my students to reach their goals. More learning: I hope to learn lots more about coaching, clicker training, learning theory, and anatomy in the year to come. I'm just itching to get my hands on more ways to help riders expand their toolkit so their horses are healthy and happy with their lot in life. Maybe a school horse of my own, maybe some showing, and maybe my own logo! More blog posts, more newsletters, more events, and more educational opportunities to network and reach out to more riders who need help. I hope to hear from you if you would like to join me - or if you would like me to join you in your search for a more balanced, graceful, safe, and effective way to be aboard a horse. Cheers! What is the point? With TAGteach™, a revolutionary new way of teaching, it’s a tag point. The tag point is the specific learning goal that the teacher will mark with a tag that highlights success for the learner. The tag pinpoints the exact moment the tag point is executed correctly and gives immediate and clear feedback to the learner or athlete. The most common and effective way to mark a correct response is with a short sharp sound made using a handheld clicker or tagger. The tag becomes a positive reinforcer through association with tangible rewards (candy for example) or as a result of the good feelings that are come from success and improvement and praise from the teacher. Younger learners keep track of their tags and trade them in for beads, stickers or other prizes. Older and higher level learners often do not require a tangible primary reinforcer, since they are reinforced just by receiving the immediate and clear feedback from the tag. TAGteach is a targeted organized approach to giving positive reinforcement that facilitates accelerated learning while minimizing frustration on the part of teacher and learner. Clarity and simplicity are key aspects of TAGteach. A tag point is defined so that the learner does not need to ask why he didn’t get a tag if the tag does not come. Tag points are never combined, since this can cause confusion, frustration and sometimes outright hostility in the learner. If a soccer player is asked to kick with the side of his foot, while looking at the target and holding his arms out for balance and the tag does not come, he will ask the coach which part he didn’t get correct. The coach will be forced to answer and this leads to verbal correction and defeats the purpose of using the TAGteach method. The TAGteacher thinks ahead, plans the succession of tag points that will be required to shape the skill and works on them one at time. As the learner becomes proficient with each piece, the entire skill naturally comes together. Sometimes a learner regresses. In this case the teacher moves back a step in the shaping plan and works back up again. Each time the learner improves more quickly than in the previous session. If a learner is having trouble, the teacher breaks the difficult aspect into even smaller increments so that the learner can succeed and earn a tag. TAGteachers learn to set their learners up for success so that learning becomes a very positive experience for both teacher and learner, with success leading to further success. The immediacy and clarity of the feedback allows the learner to form a mental picture of the movement or position in association with the tag sound. “I can see a picture of myself doing it in my head”, said a ballet student when asked to explain why TAGteach helped to fix a problem with which he had been struggling for years. This “mental picture” description is frequently articulated by learners when asked what happens in their minds when they hear the tag. Some scientists think that the click sound is processed by the amygdala, a primitive part of the brain that controls emotion and fight or flight responses. This bypasses the complex processing of speech and allows for immediate processing and action. This may explain the rapid acquisition of skills and excellent retention rates that occur in high level competitive gymnasts taught with TAGteach. TAGteach has been used in many disciplines, including business skills, music instruction, language instruction, sport coaching, speech pathology, physio and occupational therapy, medical student training, academic classroom, special needs classroom and more. “Tagging has taught my learners to think for themselves”, said kindergarten teacher Amy Roberts. “We saw an almost immediate improvement in skill execution and confidence in our Special Olympics rhythmic gymnasts”, said Debbie Boycott, head coach of the Oakville Butterflies from Oakville, ON Canada. “The athletes were very quick to understand and appreciate this way of teaching and were even able to teach each other using the TAGteach method”. This teaching each other is called peer tagging, and is one of the most powerful aspects of TAGteach. Learners learn to tag each other and in so doing become caring teachers and keen observers. These learners learn twice, once by doing and receiving feedback from the tagger and once by watching and marking the correct performance of their peer. Peer tagging allows the teacher to focus on individual pairs while everyone is working. All learners receive positive reinforcement, even the “shadow child” who often gets little recognition in a traditional teaching environment because she does not cause trouble, but neither is she a rising star. TAGteach is good for learners and teachers and it is also good for business. "Designing a safe system like this means breaking down each task into its individual components,” says Amy Duz, a corporate trainer who specializes in the fishing industry. “The process forces you to observe what goes on at every step and since everybody participates in the process, breaking something down becomes something everyone knows how to do. It's not just a job for management or the trainer, it’s everyone's job. This lends itself to more cooperation and consistency”. American international dressage rider Heather Blitz serves as the model to illustrate brilliant biomechanics, in walk, trot and canter, as well as the advanced movements. Then lessons with a number of riders at different levels show the changes they make as they take the next steps in their learning, discovering how to produce similar patterns in their bodies, and changing their horses in the process. This book looks at a series of common rider faults or problems and, through words, photos, diagrams and practical exercises, it explains how to correct them. Each issue is demonstrated by a different rider – some working at basic level, others more advanced. Mary gives each rider a lesson taking her through the changes she has to make, and recording her progress through specially taken photographs. Readers can witness the changes taking place and understand through Mary’s gifted teaching HOW to make the necessary shift to improve their own riding skills. The ‘before’ and ‘after’ pictures show not only the improvements in the rider’s position and effectiveness but also in their horse’s way of going, for the two are interconnected. American International Grand Prix dressage rider Heather Blitz, who Mary has coached for the last 14 years, acts as the ‘model’ who demonstrates exemplary biomechanics in walk, trot, and canter, as well as in the advanced movements. The book then asks, ‘What is she actually doing? Is she ‘growing tall’, is she ‘stretching her legs down’? etc.’. It offers some alternative descriptions of her skills – which are then taught in the lessons to the other riders. For a while, the notion that different students have different "learning styles" was pretty hot in educational settings. In one popular formulation of this idea, there are visual learners, auditory learners, and kinesthetic learners. A kinesthetic learner, for example, will learn more effectively by carrying out physical educational tasks than by listening to a lecture or receiving other types of "traditional" education. What all these theories have in common is the notion that an individual student's success will be predicated not just on their own effort and ability, but on their teacher's ability to identify and cater to their individual learning style. It's a nice idea, but it also appears to be wrong. Over and over, researchers have failed to find any substantive evidence for the notion of learning styles, to the point where it's been designated a "neuromyth" by some education and psychology experts. And yet it persists — Google around and you'll find plenty of information about this unsupported concept. One key question, then, is: To what extent have educators themselves gotten the message that the idea of learning styles has been more or less debunked? The results were discouraging. Of the 109 papers that met Newton's inclusion criteria, "Most (94%) of the current research papers start out with a positive view of Learning Styles, despite the aforementioned research which discredits their use," he writes. Moreover, a full 89 percent "implicitly or directly endorse the use of Learning Styles in Higher Education." So even an educator who does the right thing, who takes the time to search for the literature, could easily come to a false conclusion about this stuff. That's discouraging, and it's an unfortunate deviation from the scientific ideal that the truth not only emerges (eventually), but that it trickles down to those who benefit most from it. In this case, the trickle appears to be slow — perhaps because learning styles is such an intuitive and nice-seeming concept. If you have got this far in reading this perspective, you likely care about education, and about education research. It is in everyone’s interests for educational research and resources — time, money, effort, to be directed toward those educational interventions which demonstrably improve student learning, and away from those which do not. Take a second to run a Google search on your own institution — put in the domain name — youruniversity.edu or.ac.uk or whatever it is, alongside the term “learning styles”. Chances are, something will come up. Start there! In other words, it's time for educators themselves to step up and help put this myth to bed. This post has been updated to clarify why paywalled papers were excluded. Susan: I was watching you as you schooled Biotop in the indoor arena this morning, and it was wonderful. I noticed you were working him in a fat snaffle, and I wondered if you could talk about the importance of working in the snaffle for upper level horses. Klimke: I ride at home only once a week on the double bridle. Susan: Do you mean for most of your Grand Prix horses, or for this one especially? Klimke: All. I want to have them very light in my hand. It is easier when they are really "through", and they take the bit and take your hands. Then they are not afraid to come out to the double bridle. horses who make their extensions with over flexed necks and they score just as well... Susan: Can you explain that? Klimke: Well, when I tell you this, I don't want to sound jealous, but I live for classical riding. Classical riding means that the horse must go: that is, the energy must come through and the horse reaches forward. But the judges don't always mark accordingly. I don't mind; I know what is right. I have been in this sport for nearly 40 years. Susan: I also saw today that you were doing a lot of work on the basic paces, and simple transitions. Klimke: Yes. The horse must go forward and he must be happy. If the horse is happy and he trusts you, then you can teach him. If you punish him, that is wrong. Susan: They never forget. Is there any place for punishment in riding? Klimke: I hate to punish a horse. It must not be. It can happen to anybody. Sometimes you lose your patience, you try to make the horse a slave. But it is not right. Sometimes you see riders blowing up, even here, with top riders. I say to myself, "Poor horse, I wouldn't like to be in your stable." Susan: Why does it happen? A lot of these riders will teach and talk about riding classically, and mean to do it, but then it is different here. Is it the pressure? Klimke: I think everybody wants to win. Perhaps they think if they make a horse tired it will be submissive. Sometimes it may work, but if you really look you can see what is wrong. Some judges don't have a really good eye, and they judge by punishing mistakes, like too many or too few strides in a pirouette, for example. ￼Klimke: Yes. The principle is: how is the walk, how is the trot, how is the canter, how is the acceptance of the bridle, how does the back work--all of these things. And in addition, the figures. But they deduct too much if a figure is not 100% okay. You see? If you make a pirouette and the horse really uses his hindquarters, and maybe the pirouette is a little big, you should not be given a 5. Susan: That's a little extreme. Klimke: Yes. It can be at least a 6, can also be a 7, when the horse really canters classically. Even if the circle was too large, remember that you must deduct from 10. The judge must be able to see the main achievement of a horse and rider, in a movement. Susan: This brings up another question, and that is--there are some amazing equine athletes here, and some of them get a lot of points because of that. Where are the places in the Grand Prix test where the talent can't cover up the problems with the training? 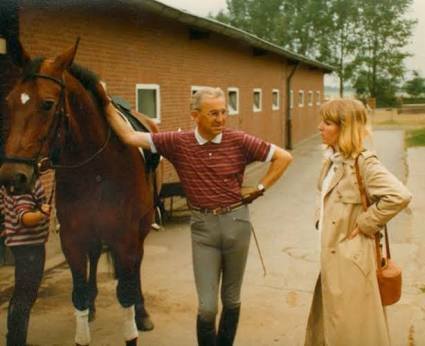 Klimke: I look only at the way that the horse moves, in all three gaits. He must come from behind, with a swinging back. The head and neck must seek the bit. I hate it if the horse comes behind the vertical and stays there. When the horse is really "through", you must be able to open and close the frame, and keep him reaching into the bit. And right now, in the judging, in my opinion, this doesn't count for enough. But sooner or later, good riding will be rewarded. You must not lose your patience, you see. And don't give up. Susan: I know that an international horse must have talent for piaffe and passage. At what point in a horse's life can you tell if that talent is there? Can you tell at the very beginning of training? Klimke: No. But when you can easily do transitions with the horse--when he shows the ability to sit back--and the half halts go through, I like to see that. And there must be the desire to do the piaffe. Susan: Whose riding do you admire? Klimke: Right now? Klimke: Okay. Nicole in her best time was very good. Of course, now her horse (Rembrandt) is 18. But look back to Stockholm (World Equestrian Games, 1990) or Barcelona (Olympics, 1992). It was just the right, wonderful picture. Nice hands. Coming to nearly invisible aids. There are some other riders who are very good in a test--it is fantastic. And when you see the same person training...well if somebody else would do this, then the vet would probably say, "Come on, not here." But they laugh and say, "So what. We're winning." Riders who ride for medals must try to be an example for classical riding. It is their duty. You cannot talk one way and ride another. Either you talk as you ride, or you explain why you don't. Susan: Do you allow people to watch you school your horses at home? Klimke: Absolutely. I have nothing to hide. I have seen riders make a fuss about spectators being allowed to watch the schooling at the World Cup Finals. This is wrong. The best thing for the horse is the open door. Susan: What's wonderful is that you have demonstrated that classical riding can win. Klimke: And I will not stay away from it. "Who is this person? " In the horse industry, sometimes this is the Million Dollar Question. A name carries a whole lot of weight in certain circles. But what happens when it's the horse asking the question? My approach is that when a horse asks me who I am, I answer with awareness, kindness, patience, clarity, and an open mind. When I meet a new student, I endeavor to do the same. I am a life-long horsewoman, and I thoroughly enjoy guiding people to a better understanding of horses and riding. I assign homework for all my students regardless of what level they are or how much experience they have. I am serious about each and every one of my students making progress, and regularly use photos and videos - which I share with the student via email and YouTube - to help document the process and as an invaluable learning tool. 2) What do you want to get out of today? I am committed to being your partner in your journey to better riding, not just a tape recording of meaningless, overused and outdated phrases. How many times has an instructor said something and it went in one ear and out the other, and three weeks later they are still saying the same thing over and over and you begin to wonder what they are talking about and why won't they move on to something that makes more sense? Or how many times have you been riding and your horse seems uncomfortable, or it's not working out the way your instructor seems to think it should, except you don't know what's wrong and your horse does not seem very pleased but you hope soon it will suddenly all fall into place or your horse will have a change of heart and decide it's not worth it to make your life so miserable? These things happen when instructors don't really understand where the problem is coming from. 99% of the time, it's the rider that could (and therefore should, I believe) solve the problem. You ask me a question, and if I don't know the answer, I will research it and get back to you as soon as I can. Unlike a lot of instructors, I actually enjoy when my students ask me questions, because it means they are thinking and processing what I'm saying! I especially love the "how?" questions, because that is when riding skills get really fun.